Several tigers have trapped five Indonesian men up a tree in a national park on Sumatra island, after mauling a sixth person to death, police say. The group was attacked on Thursday after they accidentally killed a tiger cub. One man died while the others managed to flee up some branches. The survivors alerted nearby villagers using mobile phones. It could take rescue crews up to three days before they find the men in the Gunung Leuser jungle, officials said. The national park covers nearly 7,930 sq km (3,060 sq miles) along the border of North Sumatra and Aceh provinces. A 30-member search team entered the jungle on Saturday, police chief Dicky Sondani said. Villagers had tried to rescue the men on Thursday but retreated when they saw at least four large Sumatran tigers circling around the base of the tree. "If the tigers remain under the tree, we may have to shoot or sedate them to rescue the five people," Mr Sodani added. The six men, all from Simpang Kiri village in Aceh Tamiang district, had ventured into the national park in search of rare incense wood. "People keep entering the jungle to look for the wood because it's very expensive," the police chief said. 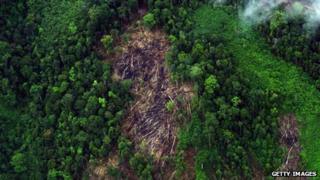 "But that's the risk: there are many tigers and elephants in Gunung Leuser jungle." The group set up deer traps for food, but accidentally caught a tiger cub. The injured animal drew nearby tigers who then pounced on the men and killed a 28-year-old only identified as David. The smallest of all tigers, Sumatran tigers are a critically endangered species only found on the Indonesian island. As few as 350 remain in the wild, of which the largest population lives in the Gunung Leuser national park.